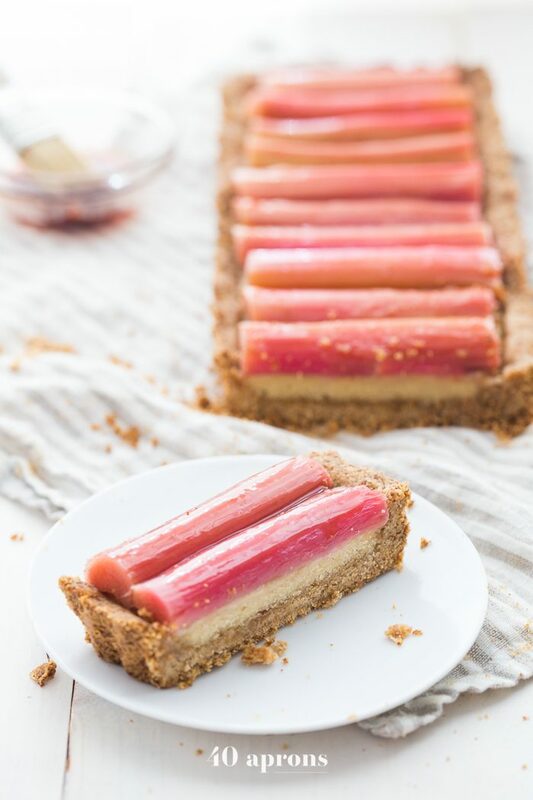 This paleo rhubarb tart is layered with a buttery shortbread crust, rich almond frangiapane filling, and finished with a perfectly sweet, tart rhubarb topping. This paleo rhubarb dessert is absolutely stunning and positively delicious, making it perfect for summer entertaining. This paleo rhubarb tart is a must-try! Buy a rectangle tart pan here. My earliest memories of rhubarb aren’t memories at all; they’re stories recounted to me as though I were both there and absent, flashes of short scenes I’ve witnessed only in photos. Like posters for movies I’ve seen in my sleep. I was three or four, visiting family in upstate New York, the ones with the pet raccoons kept in cages in the living room (and I’m pretty sure that that’s actually true). My aunt or cousin’s wife or great uncle’s wife’s niece or whoever it was, she was making strawberry rhubarb pie, and I sat on the counter with a giant bowl of the filling, stuffing it into my chubby face. Eating it by the spoonful, bangs just a little too short from the homemade haircut the aunt or cousin’s wife or great uncle’s wife’s niece had given me earlier that day. I always loved rhubarb, or so I’m told, but it took a while for me to tackle the ingredient on my own, to muster up the courage to replace this half-memory in my mind with something doubly real and potentially disappointing. I have this sort of anomalous aversion to celery, which you’ll notice on the blog, now that I’ve told you to look. And rhubarb, it just looks too much like celery, doesn’t it? Its stringy stalks and sterile edges, seeing them only trimmed and stemmed in the grocery store in this part of the country, missing the bushes in the backyard, the fresh bundles at the farmer’s market. And so, delicate memory in mind, looking a bit too much like my hated celery stalks, and, quite frankly, not having a damn clue what to really do with it, I’ve tended to avoid it even when confronted by bins of the fresh stuff at the grocery store; even when peeking at bags of trimmed slices of it, frozen next to the organic wild blueberries. But, have you noticed? 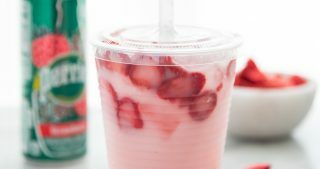 The Internet is in love with the pink stalks, and, I’ve been positively immersed in gorgeous, creative concoctions presented by the painfully talented food bloggers surrounding me. From teacakes to crumbles to one-pan chicken dishes, rhubarb is all around. And so, on a recent trip to Sprouts, I grabbed several stalks, not having a clue what to do with them or what I even wanted to do with them. But as I perused rhubarb’s corner of the Internet, inspiration hit quickly. 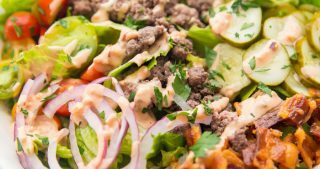 I fell in love with the stunning, rectangular tarts and decided to create a paleo version of the classical dish. 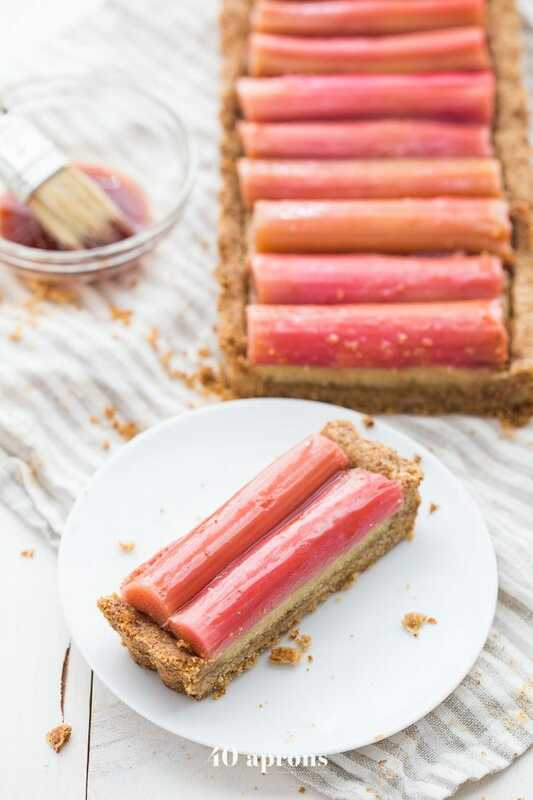 I wanted to pair a crumbly, buttery shortbread crust with a rich and heady frangiapane (sweet almond) filling, finished with a sweetened rhubarb topping. Each layer comes together easily, the bottom two whirring together in seconds in a food processor. The rhubarb topping is just as simple, simmering segments of the stalks in diluted maple syrup, cooled, and placed on the filled tart. Stunning, a tiny bit tart, and so rich, this paleo rhubarb tart is surprisingly delicious. And it’s true: I do love rhubarb. Those stories that were told to me, you know, every two years or so for the last twenty were right. I love the tart stalks and their neon hue; I love the fruity taste and the sheer weirdness of it all. I love the elegance of the slices, arranged in funky patterns. 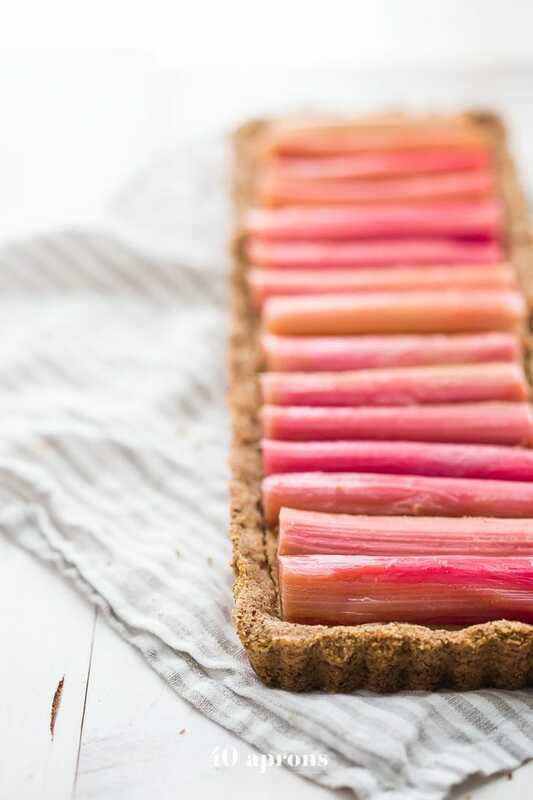 Maybe its an inherent love for rhubarb that’s lain dormant all these years, and maybe it’s these artificial memories that this dish shocks to life, but this paleo rhubarb tart might just be one of my favorite dishes I’ve made in the last year. You’ll love the buttery shortbread crust, the easy and rich frangiapane filling, and the sweet, tart rhubarb. It’s easy to put together but is so delicious and stunning. And you can make this paleo rhubarb tart a few hours ahead, making it perfect for summer entertaining. Go grab some stalks today, and take advantage of rhubarb season! 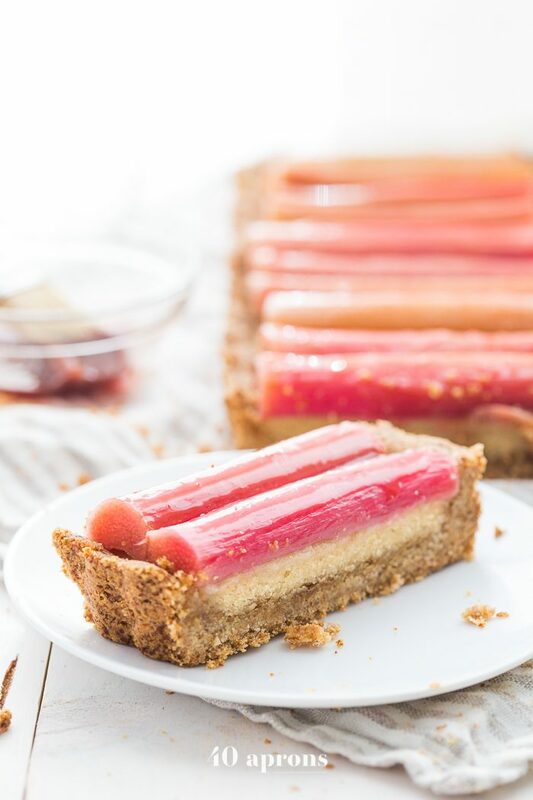 This paleo rhubarb tart is layered with a buttery shortbread crust, rich almond frangiapane filling, and finished with a perfectly sweet, tart rhubarb topping. This paleo rhubarb dessert is absolutely stunning and positively delicious, making it perfect for summer entertaining. This paleo rhubarb tart is a must-try! Cut the rhubarb into segments about 4 1/2” wide. Test their size by placing them into the empty tart pan; they should fit easily, with enough room for crust edges on both sides. 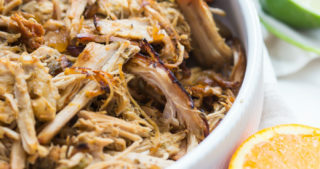 Combine the 1/4 cup maple syrup, 1 cup water, and 1/2 teaspoon vanilla extract in a wide frying pan and place over medium heat, whisking for a couple minutes until very gently simmering. 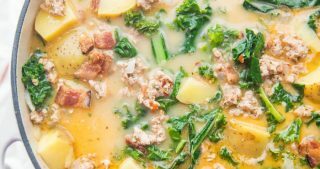 Add the rhubarb and reduce the heat slightly, simmering very gently for 5 minutes. Remove from heat, cover, and let cool in syrup, at least an hour but preferably longer (up to overnight). 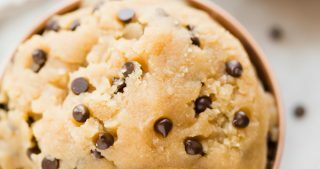 Preheat the oven to 350º F. Make your crust: in the bowl of a food processor, combine all shortbread crust ingredients. Pulse a few times, until mixture is combined and holds together when pinched. Press into the bottom of your tart pan, pressing mixture evenly all the way up the tart pan sides. Bake 11-13 minutes, or until sides are slightly brown. Let cool while you make the frangiapane. 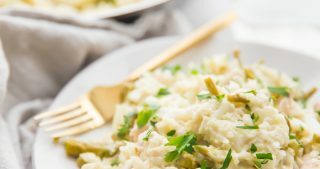 In the bowl of a food processor, combine all frangiapane ingredients. Pulse a few times, until mixture is well combined. Scrape into the partially baked tart shell and smooth surface with a spatula. Cut a large piece of aluminum foil and place tart pan in the center. Bring edges up, folding down a few times if necessary, so that the foil edges just cover the tart edges. You want the filling to brown, but not the edges of the tart. Bake for 20 minutes, or until filling is golden brown and set; a knife, stuck into the center of the filling, should come out clean. Cool completely. Top with rhubarb: strain rhubarb out of syrup, reserving syrup. Place gently, piece by piece, in a column on top of baked tart. Place pan with rhubarb syrup on the stove over medium heat, uncovered, and bring to boil. Boil until syrup is reduced to about 1/4 cup. Pour into a small bowl and, with a pastry brush, gently brush the syrup over the rhubarb topping. 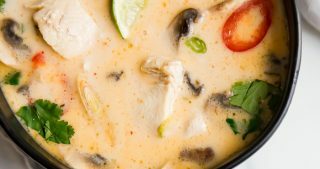 Serve immediately or cover and keep at room temperature until ready to serve later that day. 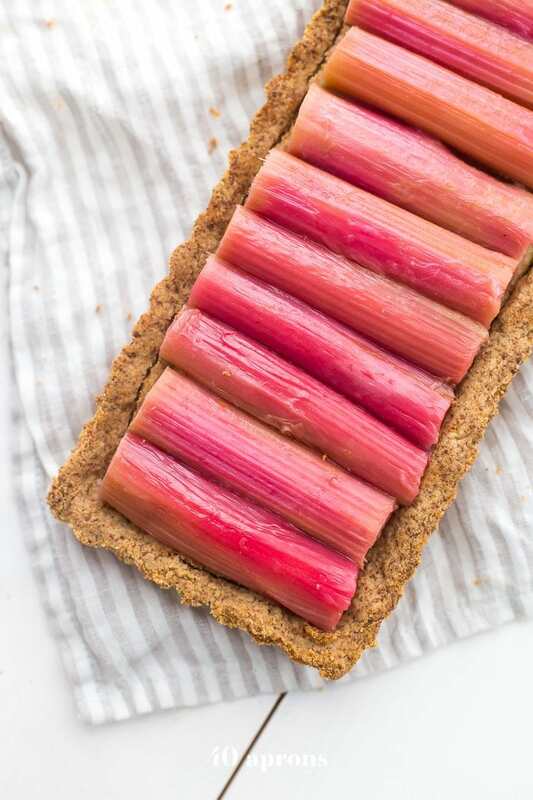 This paleo rhubarb tart is best if served that day, but can be kept in an airtight container in the refrigerator and served the next day, as well. Buy a rectangle tart pan here. If you don't have a rectangle tart pan, you could try making this in a 9x9" baking dish. 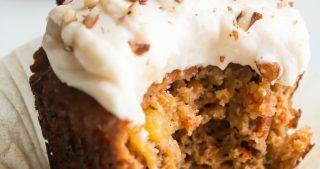 You'll need a little more rhubarb, and the filling and crust will be a bit thinner, but it would otherwise be a close substitution. I highly recommend getting a rectangle tart pan, though - so elegant and stunning (plus quite affordable)! 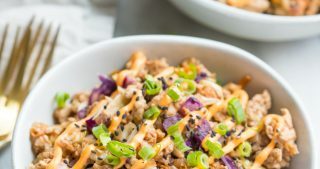 I’ve updated the recipe with the calories! This is not Dairy-Free as you claim in the title if you use ghee or butter in the crust. 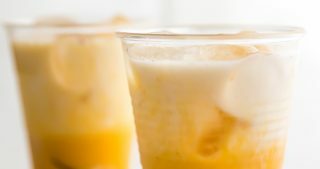 The dairy-free claim is one of the things that attracted me since I am lactose intolerant. I might try it with a dairy substitute, though. Hi Larry! You can absolutely substitute a vegan margarine or coconut oil in the crust. Ghee does not contain lactose, though, which is typically the aggravating element in dairy. Have you used it before? Can you omit the rum or replace it with rum extract? Megan, yes! You can just omit it. Yum Cheryl!! This both looks and sounds amazing. The farm stand up the road has tons of rhubarb stalks just begging me to take them home with me. This looks like the perfect reason to!